I don’t believe in reincarnation. But if there was such a thing, could you think of a more deserved next life for coke-shoveling crime boss Tony “Scarface” Montana, above, than to spend his days as a sales call-answering schlub? Neither can UK artist GsG Scar. That’s why, in “Callface,” his hand-signed and -numbered, limited-edition-of-50 print, Tony doesn’t invite you to SIE ALLO TUH MAH LEEDOH FRAH!! 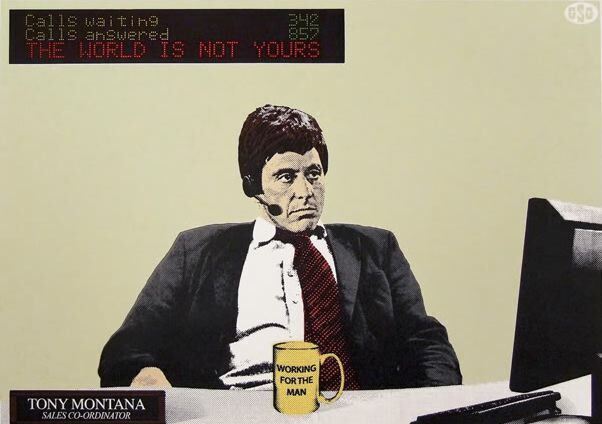 No, as played by the diminutive Al Pacino, he is your little friend, pulling up your order of 8-950s, rotor pumps, or whatever it is people who wear headsets at desks do all day. Eight-color screenprint on acid-free 300 gm paper, 19 3/4 inches by 27 1/2 inches, $156.50, incl. s/h from the Kingdom. 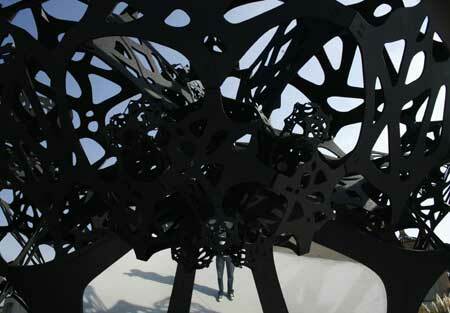 Is Architecture Out Of Control? In the book, From Control to Design: Parametric / Algorithmic Architecture, thinkers and practitioners look at the way today’s most aggressive and innovative firms are using computation to make the art of creating space a wholly new and radical venture. This 26-foot-high, 69-foot-long, 17-ton aluminum sculpture, above, “The Morning Line,” by artist Matthew Ritchie, architects Aranda/Lasch and civil engineers Arup AGU, typifies the kinds of complex structures, and constructions, with which creatives are now playing. As the book reasons, the types of innovation possible are only increasing exponentially. If the first generation of digital modeling programs allowed designers to conceive new forms and processes, a new breed of digital techniques is being discussed to control and realize these forms. How are these techniques affecting architectural practice and what potentials do they offer? Architect Irene Hwang, one of From Control to Design‘s editors, is the guest today on my WBAI-NY / 99.5 FM radio show, NONFICTION, this afternoon, Friday, August 28, at 2 pm ET. You can hear her ideas by tuning in at 2 pm. If you’re outside of the New York tri-state, check out our stream on the web. If you miss the live show, dig into our archives for up to 90 days after broadcast. 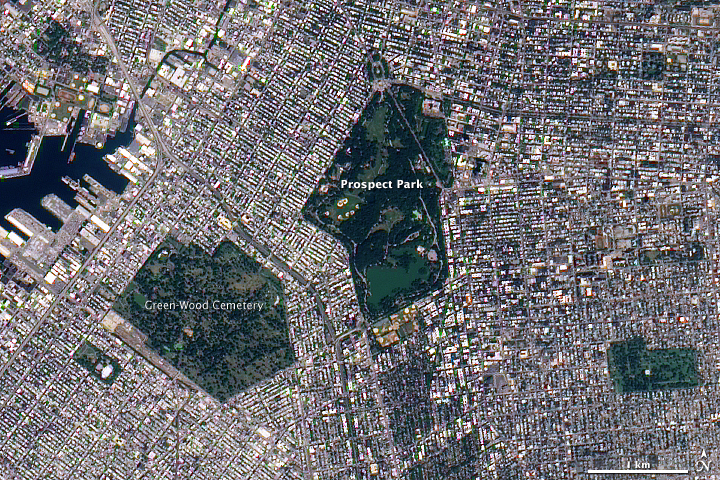 Familiar landmarks within New York City’s largest borough dominate this image, above. The spectacularly detailed view was shot by NASA’s EO-1 (Earth Observatory) satellite, as it hovered over 438 miles above the nation’s most populated city, on September 12, 2001. Microsoft Introduces Its Most Advanced Application, Yet: Windows RaceChange Suite Express for Vista. See Orlando, the one in the middle, above? He’s smiling, but, like a lot of Black people, deep down inside, he’s tired of being ignored. Passed over for promotions. Always asked to work on his company’s “ethnic marketing” campaigns. 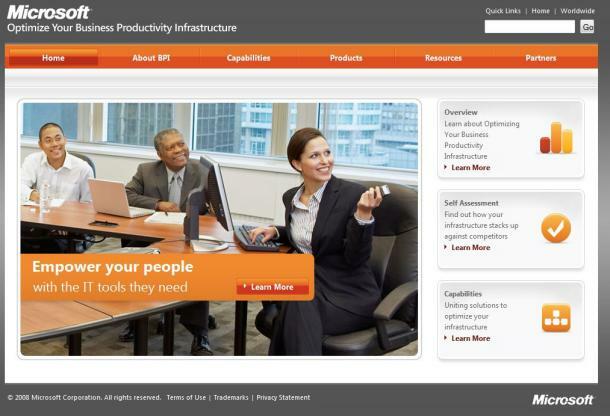 I mean, look at him: He’s the oldest guy in his unit, because everybody who got hired when he came on has moved up. Meanwhile, Jenny, right, is team leader, and in line for the division president position. Ignore the Asian guy! Grrrrrrrrrrr. It’s enough to infuriate a person. Or, at least, it was. But that was before we, at Microsoft, introduced The Microsoft Advantage, courtesy of our most advanced software to-date: Windows RaceChange Suite Express for Vista. With a few quick taps on his laptop, Orlando, above, becomes “Bob,” below. WOW! Look at him now! Wouldn’t you like that guy running North American sales? Notice the respect, the vitality! That’s the kind of man that leads men…and Jenny to the bedroom! Microsoft Windows RaceChange Suite Express for Vista: And, remember: At Microsoft, race isn’t a bug. It’s a feature. The Fast and the Furious Five. All of us can remember people who who changed us forever. I’m talking about those individuals whose advice gave us needed direction when our lives came to diverging paths. There, we had to make a choice about what we’d do, and, though we didn’t know it then, that decision would affect the rest of our existences. They’re the people without whom our personal stories would be pale, unremarkable versions of the glorious ones we ultimately chose, and now inhabit. 1) “Mark Vincent…I dunno. Vincent…Vincent…um…Vin? Don’t you think “Vin” would be catchier? Laughing With You, Or At You? : Does Yale’s “Single Asians” Debunk or Traffic Old Stereotypes? Adam Clayton Powell was fond of noting that Harvard University had “ruined more Negroes than bad whiskey.” Well, perhaps his Korean counterpart is somewhere saying the same thing about Asians at Yale. 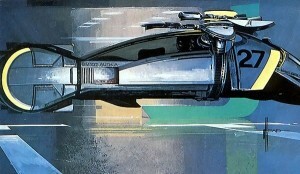 Syd Mead’s Cutting Edge Universe. For years, conceptual designer Syd Mead has been the man to whom companies go when they need to advance an audacious vision of the impending future. Sydney Jay Mead was born in 1933, in Saint Paul, MN, to a Baptist minister and his wife. After graduating from the Art Center in Los Angeles in 1959, he worked at Ford Motor Company’s Advanced Styling Center in Dearborn, MI for two years. 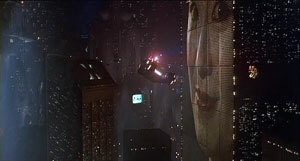 He then spent part of the next decade rendering now legendary concept illustration for U.S. Steel, above. 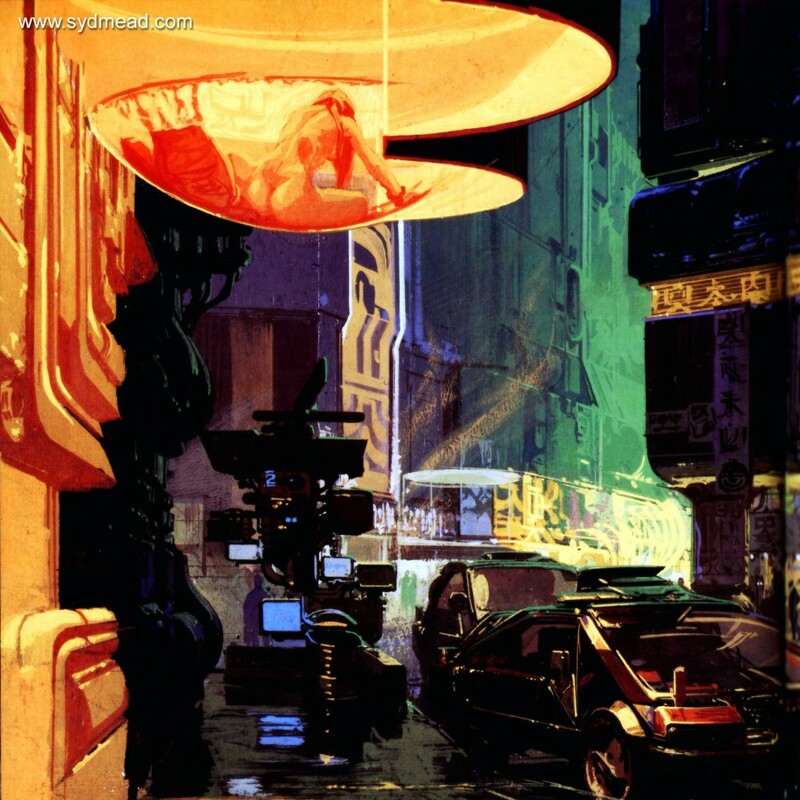 “He painted,” one Mead fan site notes, “using a slick, detailed method that made the future seem fresh, clean, and thrilling.” He started Syd Mead, Inc. in 1970. Sammon, Mead, director Steven Lisberger (Tron) and other industry vets testify in director Joaquin Montalvan’s 2005 documentary, Visual Futurist: The Art & Life of Syd Mead. 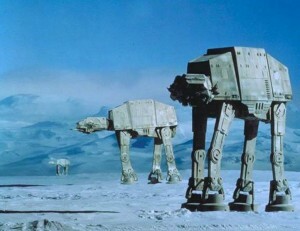 The film tells Mead’s story from his own perspective, as well as from that of the people with whom he’s worked. It’s a rich document about a little-known man, but one whose whose ideas are deeply and widely embedded in American popular culture. Joaquin Montalvan is a guest today on my WBAI-NY / 99.5 FM radio show, NONFICTION, this afternoon, Friday, August 21, at 2 pm ET. • Change the rhetoric and you change the communication. • Change the communication and you change the experience. • Change the experience and you change a person’s orientation to the world. • Change that orientation and you create conditions for profound social change. You can hear Jason Del Gandio’s and Joaquin Montalvan’s ideas by tuning in at 2 pm. If you’re outside of the New York tri-state, check out our stream on the web. If you miss the live show, dig into our archives for up to 90 days after broadcast. The Simpsons Go Blackface? 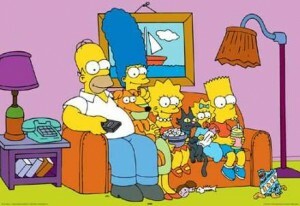 : In Ad For Their African Edition, Homer, Marge, and the Kids MASSIVE FAIL. Those are the results, above, says the UK’s Telegraph: “Brown skin instead of their usual yellow,” right. 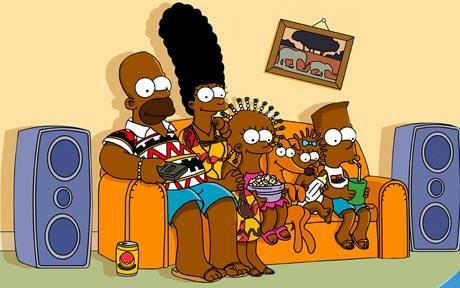 To make them appear more like a typical Angolan family, Marge has also been given a black Afro hairstyle instead of normal blue bouffant, while Lisa’s hair is stood up on end in short braids. The image also shows the family dressed in clothes bearing traditional African designs and they are all wearing flip flops. To be clear, this change was not made to the actual animation, but to print advertising being shown in the broadcast area. Will Angolans be offended? Actor Kirstie Alley once told me that African-Americans…are “more free and fun and light hearted” than white people. Did she mean Africans, too? Let’s hope so, and let’s trust they won’t be put off, here, by dumb, cloying marketing at its worst, and, in so doing, avoid what’s still a very funny show. 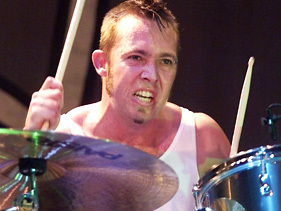 Shy Tony’s Revenge: The VIBE TV Clip That Outlives Its Wack Progenitor. The program always felt sluggish and old. 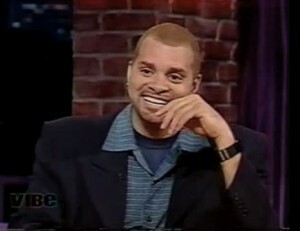 (Hiring Sinbad, right, as the second host, after comic Chris Spencer’s anemic few months, did little to correct this.) It was as if someone had found a tattered, bled-through copy of the magazine in a trash heap, saw the name, liked it, and decided to make a program with it out of whatever stage props they had on hand. When it debuted, I watched it at a nearby bar with others from our office, but almost never after that. It’s not a high point in the magazine’s hallowed history. There’s one moment from VIBE I remember, however, and it’s the only bit I ever saw there that not only still cracks me up, but that, to me, hinted at the show’s possibilities. Usually, when I write an obituary in MEDIA ASSASSIN, it’s for someone whose work has affected me in a profound way over time. People who come to mind include comedians Bernie Mac and George Carlin; writer Arthur C. Clarke; dancer Cyd Charisse; chanteuse Eartha Kitt; architect Jørn Utzon; and, obviously, singer Michael Jackson. I’m speaking of the band’s hit single, “Miserable,” from the Orange County natives’ 1999 platinum album, A Place in the Sun. Most of all, though, I’m talking about the track’s eye-popping music video, top, by director Evan Bernard.